Extensive outpatient and residential programs for developmentally disabled adults. After-school, summer, and early childhood development programs. Services include counseling, education, and mentoring. Services for adults and youth throughout the Chicago area. Services include psychiatric inpatient and outpatient care for adolescents, ages 13 and above. Services for developmentally delayed youth and substance abuse treatment for youth are not provided. Inpatient, intensive partial and outpatient services are provided including child, adolescent and adult psychiatry services. Collaborative and effective programs in English and Spanish. Serves families living in or around the North Lawndale area. Both residential long-term treatment (more than 30 days) and outpatient treatment are provided. Potential clients include adolescents, persons with co-occurring mental and substance abuse disorders, women, men, and clients referred by the Criminal Justice system. Hotline operates statewide 24 hours a day, 7 days a week. May refer clients to local counseling services, residential placement or the appropriate SASS agencies (for mental health services). Largest Hispanic social service agency in Chicago. Provides programs for all ages. Provides mental health services throughout Chicago. Payment assessed on a sliding fee scale. Fulfills the Church’s role in the mission of charity to anyone in need by providing services that strengthen and support individuals, families and communities based on the value and dignity of human life. Catholic Charities serves Cook and Lake Counties. Some services may only be offered in selected locations. Specializes in the treatment of adults, adolescents and children with psychiatric and/or chemical-dependency issues. Creates awareness around identifying and treating behavioral illnesses and their impact on people’s lives. Counseling services help children stay out of trouble, improve school performance, and ultimately prevent them from entering the juvenile justice system. Programs for pregnant teens and single moms facing unplanned pregnancies provide parenting education while reducing the risk of abuse and neglect. Caring for people and improving total wellness through the integration of our counseling and medical centers. Serves adults and children suffering from mental illness, substance abuse, emotional trauma and sexual assault. Spanish speaking clients are welcome. For those who live in Oak Park/River Forest, payment is available on a sliding fee scale. For those living outside of Oak Park/River Forest, if they have insurance but cannot afford the co-pay, there are options. In this case, the family would need to speak with our Admissions team. The family needs to say that they were referred by Mercy Home for Boys & Girls. 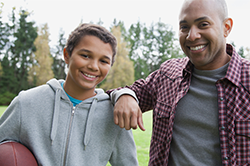 Provides substance abuse programs for males, ages 13-20. GED programs for youth, ages 13-18. Offers free group counseling for youth, ages 10-19, on Tuesdays. Day treatment programs are available for children (6-12 years old) and adolescents (12-18 years old) with behavioral and emotional problems. Assists youth, ages 12-17, in achieving a healthy transition to young adulthood, as well as providing intervention to youth who have run away, been abused, neglected, or are going through stressful times in their lives. Provides a wide range of social services, without charge, to young people and their families in Northfield, Deerfield, New Trier and West Deerfield Townships. Service-based human rights organization focused on helping men, women, and children in crisis. Offers shelter and food for young men and women aged 18-21. Youth suffering from drug addiction are accepted, but are required to enroll in a substance abuse program. Payment accepted includes self-pay, Medicare, Medicaid and insurance. Suburban locations are also available. Provides outpatient individual and group services for all ages. Provides effective counseling, therapy, and training programs to help children, families, and individuals. A crisis department of Northwester Memorial Hospital. Provides treatment for adolescents and adults. Also treats adolescents who have mild substance abuse problems and are also dealing with other issues (i.e. depression, anger management, needs counseling, etc). Provides a Growth and Action program. Explores how society impacts girls today discussing the pressures and demands placed on girls, the managing relationships of family and friends, and making decisions about the future. Group, individual, family and adolescent therapy is available. Program for pregnant and parenting teens and their partners, ages 14-19. Works with youth and their families to overcome difficulties and stabilize lives.